Shinjuku City Official Website > Foreign Language Top Page > Useful Information > Shinjuku City Offers Shinjuku Free Wi-Fi! To accommodate tourists who will be visiting Japan during the 2020 Tokyo Olympics and Paralympics, Shinjuku City is comprehensively reworking its policies related to culture and tourism, and improving its urban infrastructure as well as incorporating universal design. As a part of these efforts, the city is now providing a public wireless LAN service, Shinjuku Free Wi-Fi, which people can use in public spaces around the city. 1. These procedures are not required if you have already registered with a cooperative public wireless LAN service. 2. These procedures are not required if you have already registered with the Japan Connected-Free Wi-Fi app. There are currently around ten outdoor hot spots where this service can be used. For more information, please click on “Available Area” below. The available areas are identified with the mark of Shinjuku’s Tourism Ambassador, Godzilla. Note: Some areas show old signs used during the experimental service period. Set up the Wi-Fi and activate the browser. Go to a Wi-Fi spot. Tap “Setup” on your smartphone or other such device. Switch your Wi-Fi to “On” and choose “Shinjuku Free Wi-Fi” from the network list. Activate your web browser and open the access information screen. Note: This is only necessary the first time you use the service. From then on you will be connected automatically. Follow the instructions on the information screen and complete registration procedures. The information screen will appear. Follow the instructions to complete registration. At the end of the instructions, the security agreement will appear. After you indicate your agreement, you will have access. This completes the flow of procedures. Thereafter you can use the service after indicating your acceptance of the security agreement. To expand Shinjuku Free Wi-Fi services, we have also made Shinjuku Free Wi-Fi_01 available at private facilities, including shops, with the cooperation of NTT group companies. For information on the available locations, please visit the Shinjuku Convention & Visitors Bureau (http://www.kanko-shinjuku.jp/). For inquiries concerning Shinjuku Free Wi-Fi access procedures, please use the designated call center. Applicable Inquiries: Wi-Fi use conditions, operation procedures, information on communication failure and more. When making a call, please tell the operator your location and the type of device you are using. 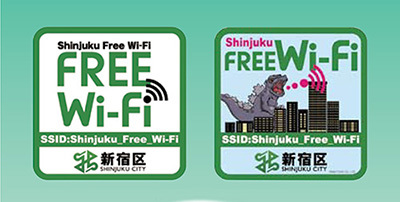 If you use the Japan Connected-Free Wi-Fi service, you can use Shinjuku Free Wi-Fi and other free Wi-Fi services at airports, stations, convenience stores and other locations without registering as a user. For more information, please read the introduction page of the NTT Broadband Platform (http://www.ntt-bp.net/jcfw/ja.html).